To order through Bite Squad click here! 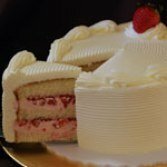 Vanilla cake layered with light strawberry mousse & fresh chopped strawberries. Please note when placing your order you can add writing in chocolate (we do not use dyes), curly ribbons and silk floral in your choice of colors. Please specify your selection in the "Special Requests" section.